This item is covered by HTEKSOLUTIONS Return Policy. Pros: Would have someting to put here if it didn't fail. Cons: Typical 3.5" non SSD drive with decent cache. Tin roof ...rusted. Other Thoughts: Had issues from the start, kept doing windows repair boot-ups on a 1st-month fresh install of windows. Giving the benifit of the doubt it might be something else causing the issue... I did a fresh/clean install of windows that lasted a little longer before the same issues happened. So I went to WorstbuY and got a new drive to be sure it wasnt something else like bad memory chips and installed it and it's doing just fine months later. 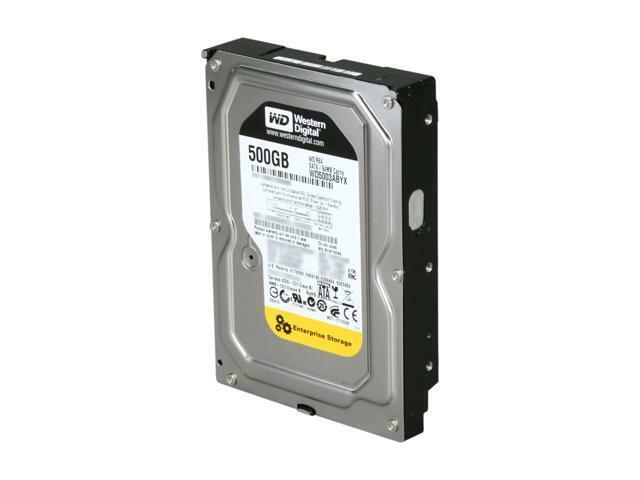 I will only buy Hdd or SSd's from Newegg or other real companies as I do not trust my personal info should a storage device fail and need to be returned. This is just my own opinion. My final rating is also based on the feedback I read on this, thinking I wouldn't have "thier" problems, I was wrong, I do not wish to comply with sending this back for refund or exchange so I will make it my own personal lesson. Good luck! It is unfortunate hearing about your experience receiving the WD RE4 drive that was not working for you. Thanks for the time providing feedback; it's always appreciated receiving input from our customers. For your convenience we placed links to useful articles below providing more information about testing a WD drive for problems. All our products must pass our stringent quality standards before leaving our factory to be free from defects in materials and craftsmanship. We stand behind our products throughout the device's factory warranty period; and would be happy to help determine the root cause of this abnormal behavior. Please contact us and mention the support case below for assistance. Pros: Good speed and reliability and because it is "EOL" the value is super. Other Thoughts: Some people that purchase products don't do their homework first. I see some folks rate the WD5003ABYX low because it isn't a brand new, left the factory yesterday drive. And that is true. If you buy a "new" one, it's probably sat on a shelf in its wrapper for 2--6 years... So what? Did SATA change and they forgot to tell us? If you buy a "used" one, expect 25,000 hours but only 8-10 power on cycles in a server. I've used a lot of these and for the price and reliability, I'll take a gamble on not having full warranty coverage. Pros: After 7 years in use, this hard drive still out performs many of the standard drives I've used, and you can barely hear it running most of the time. Other Thoughts: A great "D" drive for mass storage if you want to keep your system on an SSD for performance. Pros: drive works great. exact replacement for failed drive. outstanding service by a 5-egg seller! Other Thoughts: highly recommend seller. Pros: Not sure what to say...the shipping was as promised I guess. Cons: I bought two 500 GB drives, they are being sold as NEW. Well, hello... The manufacture date was 24 DEC 2011 on one and 13 OCT 2012 on the other!!!!??? It is now almost MAY 2017!!! Seriously!? Pros: Works great, wanted for an older second computer. Seller is very professional and customer oriented which is a can't miss formula for success. Would not hesitate to purchase from this seller again. Pros: was cheap, 'trusted' name. Cons: I purchased this in May 2016. After 5 months, I noticed it was starting to get louder and louder when it reads/writes (clattering). Then from then until now, it intermittently is unrecognized by the BIOS during bootup, and other times during gameplay my computer just freezes. It takes a few bootups before the drive is finally recognized by the BIOS again, and it will last for a few more days before same thing happens. Sometimes it is constantly 'reading', as per the front LED. Now this drive is on its last leg, basically choosing when it wants to work. Crapping out, in such a short amount of time. Low quality, cheap, I would not recommend. Other Thoughts: I also won't get my 1-year return policy, as this product is "Ineligible For Return" for some reason. So much for my 1-year. I don't recommend this drive. Depending on who the warranty is through, I wouldn't recommend them either as they're not honoring my warranty. Other Thoughts: I used this in my 12 year old brother's first PC build and he couldn't be happier with it.